I have been busy lately recipe testing and planning the last details of my very first supper club this Friday! I am soooo excited about it, I have been doing so much planning for it these past weeks, it feels weird that it is finally happening, a bit like my wedding day! I will be serving mostly recipes from Casablanca such as my traditional chicken bastila, zaalouk, baby courgette, thyme and lamb tagine mqualli and Moroccan mint tea chocolate pots. 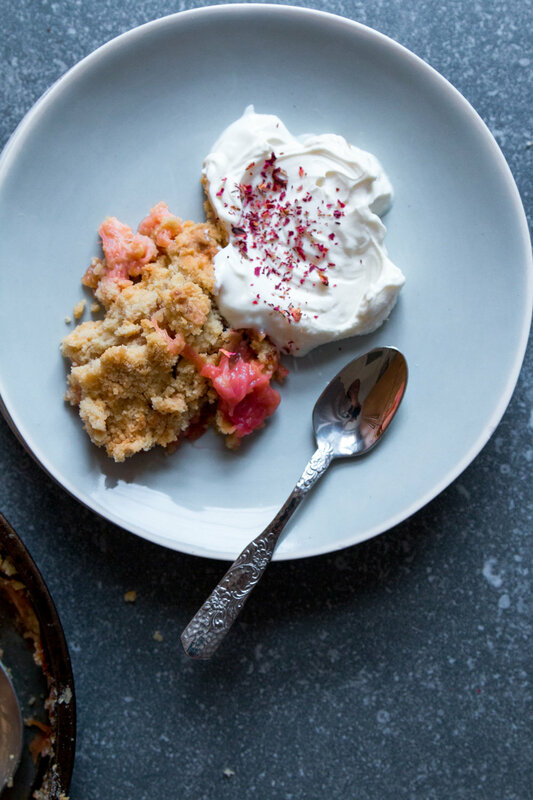 One of the recipes I have been testing is this rhubarb, ginger and rose crumble. This recipe transports so many flavours and textures. It’s sour, sweet, fragrant, creamy and crumbly. 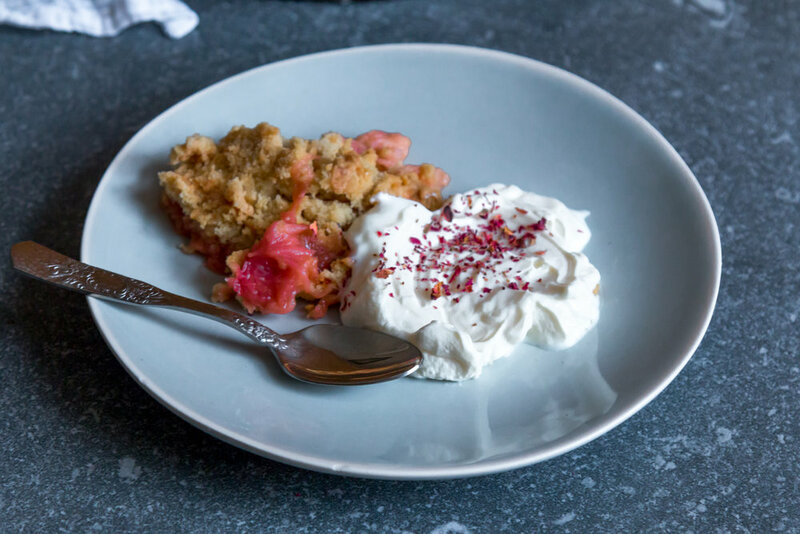 I like to serve this particular crumble with labneh to add a bit more creaminess and tartness to the whole experience but feel free to serve it with Greek yoghurt, custard or ice cream or even nothing else but the crumble. • Preheat oven to 200 C / 400 F. Grease an oven proof dish with the butter and set aside (I used a 20 cm/8 inch round tin). • Trim the ends of the rhubarb and roughly slice it into 3 cm pieces. Transfer the rhubarb in a large mixing bowl and add in the ginger stem, syrup, light brown sugar and rose water. Mix well to combine all the ingredients and set aside. • In a separate mixing bowl add in the flour, ground ginger and salt. Take the butter from the fridge and cut it into 1 cm cubes. Using your finger tips, rub the flour into the butter until the mixture looks like coarse breadcrumbs and you can’t feel the butter anymore. Make sure you use your fingertips and not your hand palms as this will warm up the butter and you need to keep it cold in order to obtain the right crumbly texture. Add in the sugar and use a large spoon (or your fingers tips) to mix to combine. • Transfer the rhubarb mixture in the greased dish and sprinkle the crumble mixture over the rhubarb making sure that all the rhubarb is now covered. 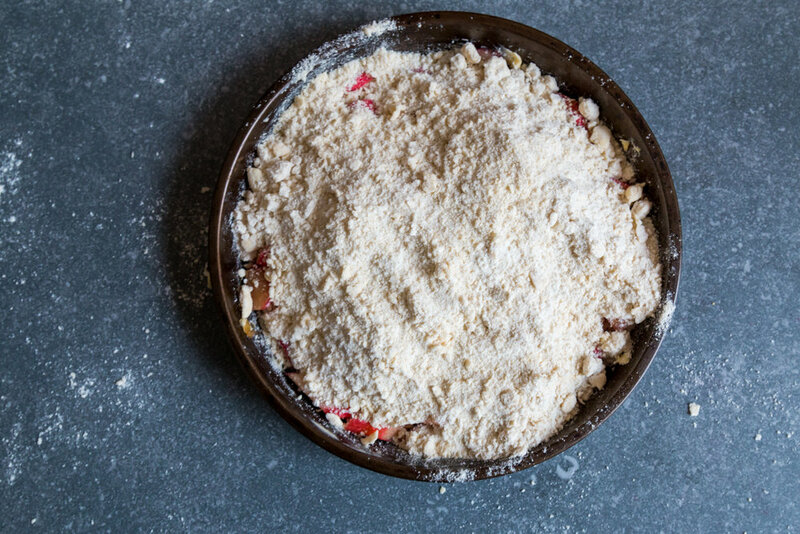 Don’t be tempted to press the crumble mixture onto the rhubarb because this will make the crumble more cake-y and less crumbly. 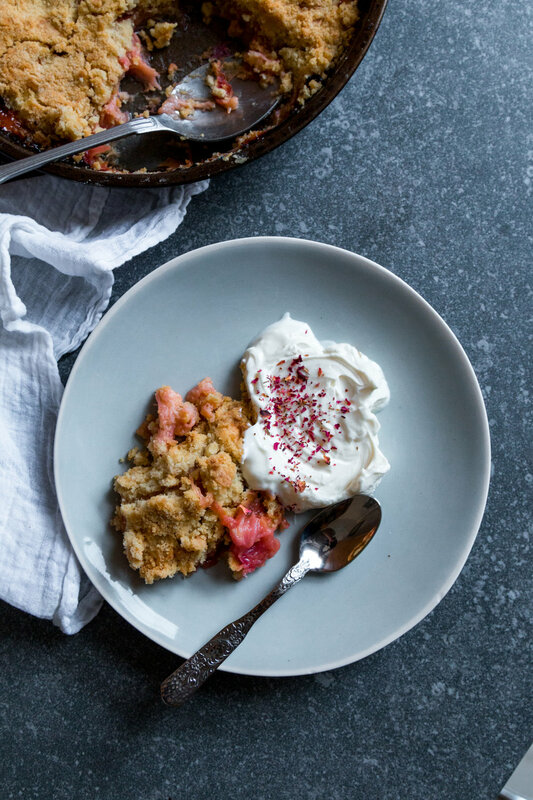 • Place in the oven for 40 to 45 minutes or until the rhubarb is soft and the crumble is golden. Serve warm with labneh, Greek yoghurt, custard or ice cream, if desired. Garnish with rose petals, if desired.